Outback Deck Inc. offers the highest quality exotic hardwood species, such as Ipe, Tigerwood, Cumaru and Garapa, and our specialists can help you choose the best solution for your deck. Most boardwalks are made out of tropical hardwood, because they are strong and durable enough to withstand the pounding of heels, hail and other types of impact. In fact, Ipe can last for up to a century! Interested in a hardwood deck for your home? 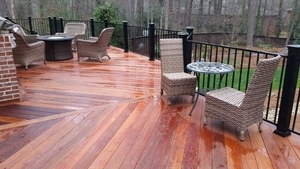 We offer a full range of custom deck design and construction services in Roswell, Alpharetta, Marietta and the Greater Northwestern Atlanta area. 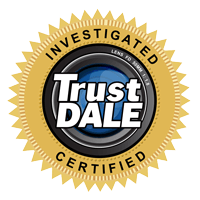 For questions or to setup a free design consultation with us, give us a call at 1-844-386-0003 or click below to request an estimate. Ipe (pronounced EE-pay), Brazilian hardwood, is the most popular exotic hardwood material. 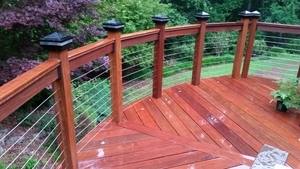 If you want a deck that will stand the test of time and is low maintenance, Ipe might be the decking solution for you. Ipe is up to eight times harder than cedar, redwood and southern yellow pine, making it half as likely to bow over time. Ipe also resists surface checking and mold. Tigerwood decking is known for its distinctive striped look. Tigerwood can resist scratching and lasts 25 years or more. 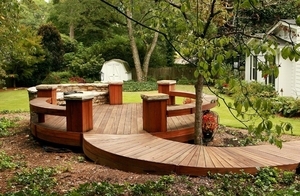 Tigerwood is up to six times harder than traditional decking materials like cedar, redwood and southern yellow pine. If you want to make a bold statement with decking that can also withstand wear and tear, consider Tigerwood decking. Cumaru is a more affordable alternative to other hardwood decking products, and provides almost the same look and strength as Ipe. Cumaru is ten times harder than cedar and seven times harder than redwood and southern yellow pine. Cumaru decking is resistant to mold, insects and rot, and is one of the few hardwood decking products that's flame resistant. While Garapa doesn't have the same hardness as Ipe or Tigerwood, it's still about four times harder than redwood and cedar, and offers beauty and affordability. Garapa is naturally resistant to decay and rot caused by weather and insects. If you're interested in upgrading your home and outdoor living space with a hardwood deck or any of our other decking products, contact us today to schedule your no-obligation, free design consultation and estimate.